5 negatives : b&w; ; 120 mm. Published in Rafu Shimpo, January 30, 1971. Los Angeles-Nagoya Sister City Affliliation New Year party held at the Department of Water & Power (DWP) in Los Angeles, California, January 19, 1971. 2N: People viewing Japanese cultural display in lobby of DWP. African American man and Caucasian man stand at right behind stanchion looking at display of dolls and bonsai at left. 3N: People socializing in lobby of DWP where Japanese cultural display is located. Tail of carp, or koinobori, hangs from upper level. Ikebana on tables along wall at left. Men wear suits and women are in dresses and kimonos. 4N: Three men in suits stand side by side holding a plaque, "Simon E. Russen". Japanese man wearing multicolored necktie stands in center with "Host" ribbon on lapel, flanked by two Caucasian men. Man on left wears a "Host" ribbon. 5N: Los Angeles Mayor Sam Yorty speaks to Japanese and Caucasian audience. 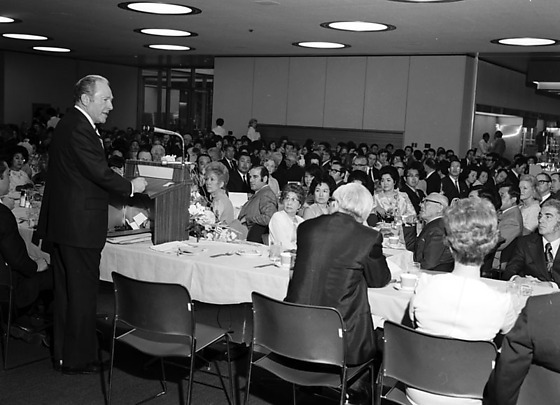 Dressed in suit, Yorty stands behind podium with microphone at head table in foreground. Audience in background. Typed on original envelope: Nagoya Sister City NY Party at Department of Water & Power.